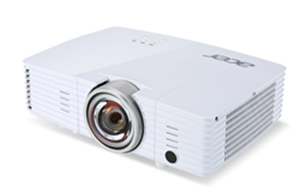 The new Acer S385WHne professional series projector boasts short-throw technology and 20W integrated audio — enough sound for an auditorium-sized room. Smart pen compatibility for interactive presentations. For interactivity, an optional Acer Smart Pen communicates with the projector directly via RF so that presenters can write on the projected image. The pen also functions as a remote control, and can be used from up to 32 feet away from the screen. Up to two users can write and draw simultaneously on the same screen. MSRP for the Acer S1385WHne is $749. For more information, visit the Acer site.